Vincenza (Vinnie) Veglatte, nee Molinari, passed away on March 17, 2019 at Bridgeway Care Center surrounded by her family. Vinnie was born on July 6, 1925 and raised in North Plainfield and settled in Middlesex in 1959 where she and her husband, James Veglatte, Sr. raised their family of four children. In 2015 she moved to Brandywine Assisted Living. She was a devout communicant of Our Lady of Mount Virgin Church for 60 years. Vinnie was well known as the baker of the family and earned high regard for her specialty cakes. She enjoyed gardening and cooking for her family and visiting with her friends and neighbors. 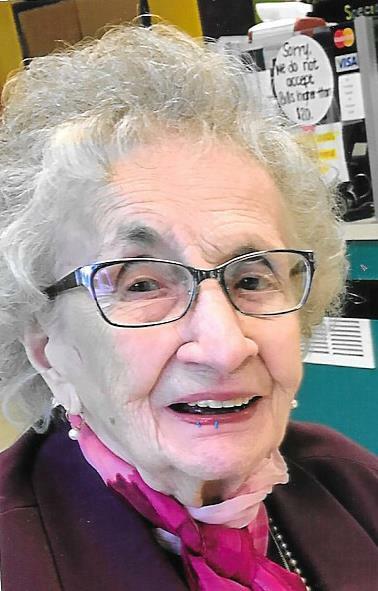 In later years, she had many new friends at Brandywine Assisted Living where she learned the art of beading and made copious amounts of bracelets to share with everyone she loved. She is predeceased by her husband, James, Sr.; her parents Maria Abruzzese and Joseph Molinari and her step-father, Arturo Abruzzese; sisters, Norma Penna and Annabelle Boumpani. Surviving are her daughters, Anita Venditti and husband Tony of McLean, Virginia; Connie Radlof and husband George of Middlesex; Maria Santye and husband Robert of Skillman; son James Veglatte, Jr. of Middlesex; . Also surviving is her sister, Gloria Falconeri of Raritan, and brother, Arthur Abruzzese and wife Dolores of Manville. Also surviving are her three beloved grandchildren, Robert Radlof and wife Bryanne; Jonathan Santye and Dana Santye; one great-grandson, Charles James (Charlie) Radlof, as well as many adoring nieces and nephews.